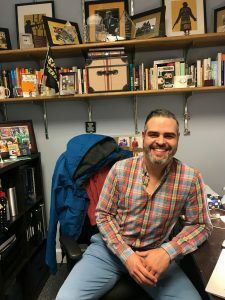 JC Lopez has been at DePauw University for 10 years, and his bookshelves full of awards, letters, and photos show his commitment to students at DePauw. He said his passion is his students, and he has enjoyed sharing in their interests and experiences. “I feel like I have grown up here, and I have grown up with the students,” Lopez said. Although when Lopez first took the job at DePauw, he did not think he would stay for so long. “I thought it was going to be my entry-level job for two years. Ten years later I am still here,” Lopez said. Growing up, however, Lopez moved around a lot. He was born in Puerto Rico, where he was raised until he turned 5 years old. Because his dad was in the military, they moved to Boston, only to move back to Puerto Rico for middle school, and then to Pittsburgh for high school. “From Puerto Rico to the states, to Puerto Rico, (back to the) states; it shaped me,” Lopez said. Lopez is thankful for all that his parents sacrificed. 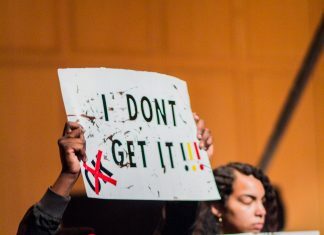 “I think me being able to go to school is important for me and I think that was monumental for my parents that I was able to do something that they didn’t get a chance to do,” Lopez said.